A turbulent 2017 saw Clariant announce plans for a merger only to later abandon them. CEO Hariolf Kottmann and the Chairman of the Board of Directors Rudolf Wehrli discuss what led to these decisions and how Clariant nevertheless stayed the course for growth. Mr. Wehrli, Mr. Kottmann, how did you experience this rather turbulent year? Hariolf Kottmann At the beginning of 2017, we found ourselves in a challenging situation. A weak oil price and the volatile economic environment were impacting our overall business performance. However, in the course of the year we managed to turn the tables. In the end we actually achieved our 2017 objectives in terms of growth and profitability: we delivered 9 % sales growth and an improvement of the absolute EBITDA before exceptional items of 10 % to CHF 974 million. Cash flow generation, however, was still lagging behind our own ambition and remains a challenge. This was, of course, not the only challenge we had to face. Ongoing consolidation in the chemical industry has led to a steady decrease in the number of companies that are of similar size as Clariant. Seeing that companies of this kind are either bought by competitors or deliberately split up in order to sell their individual businesses, we decided to act. Rudolf Wehrli Our goal has always been to lead our company into the future without losing its brand, culture, portfolio, and established management team. The best way to achieve this goal is to gain a certain size – size matters in our industry. However, we were neither able nor willing to incur massive debts to make a major acquisition. Therefore, a merger of equals appeared to be the best available option at the time. Clariant’s intention was to merge with the American chemical company, Huntsman. However, as we all know, your plans failed. How could that happen? Rudolf Wehrli The continued accumulation of Clariant shares by activist investor White Tale Holdings and its opposition to the transaction, caused an increasing uncertainty in the market. Given the fact that less than 60 % of the votes are present in an average Annual General Meeting, it became more and more difficult to secure the two-thirds majority shareholder approval that would have been required to approve the transaction under Swiss law. To avoid disruption and further uncertainty, Clariant and Huntsman jointly decided to terminate the merger agreement. By this, we avoided a significant break-up fee and did what we always do: we acted in the best interest of all our shareholders. Absolute EBITDA before exceptional items increased by 10 % to CHF 974 million. Does that mean a minority shareholder single-handedly decided the fate of the company? Hariolf Kottmann No, White Tale was our biggest shareholder, but still a minority shareholder; the company was and is run by the Board of Directors and the Executive Committee. We acted decisively when planning the merger with Huntsman, and we acted just as decisively when we abandoned it due to the changed situation. At no time did we stray off our strategic path of value creation. We had several meetings with White Tale with the intention to share our corporate strategy and our vision for the future of Clariant and to listen to their plans. White Tale, however, was not interested in our strategy and did not reveal any plans. Instead, they made several requests, from immediately selling Plastics & Coatings to hiring an additional investment bank and giving them three seats on our Board of Directors. We saw their demands as aimed at one goal only: to break up the company and to maximize their own investment. To prevent that from happening, we had to come up with other ideas to create value as it was expected by the financial market. And the idea you came up with was to find a white knight to get rid of the activist investor? Hariolf Kottmann We have always said that one of Clariant’s strategic options was to get another anchor investor. Clariant has been in contact with SABIC for many years. SABIC is not only an important customer, but also a joint venture partner for Clariant. Since the takeover of Süd-Chemie in 2011, we have been closely linked. I already had extensive strategic discussions with SABIC from 2012 through 2014. Due to a change in management, however, they were put on hold for a while. But since then we have been in regular contact again. This dialogue was intensified once we terminated the planned merger with Huntsman. There were many informal discussions and meetings, for example during the GPCA Forum in Dubai at the end of November 2017, to which SABIC’s CEO Yousef Abdullah Al-Benyan had invited me as keynote speaker. We were, however, not involved in the acquisition of the shares by SABIC from White Tale. We were simply informed in advance as is usual in such cases. But we opened the door for SABIC early on. What are SABIC’s plans? Is the Saudi Arabian company interested in selling parts of the Clariant businesses, too? 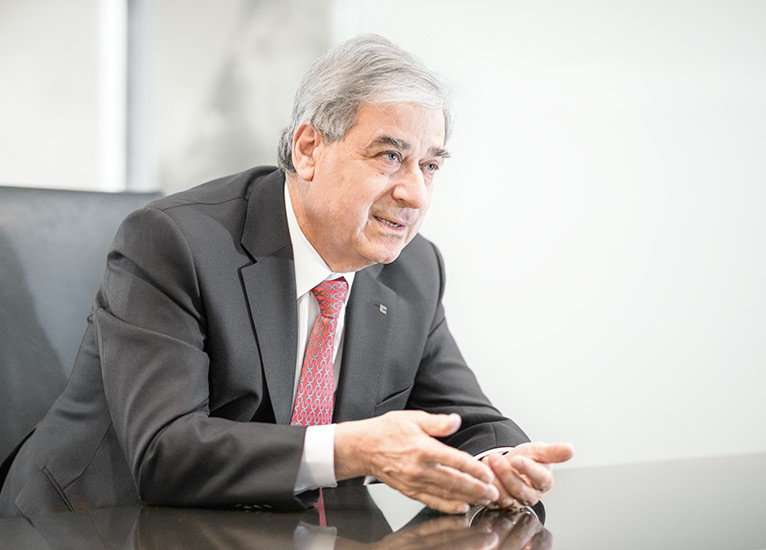 Rudolf Wehrli We are in intensive talks with our new major shareholder SABIC to identify opportunities to accelerate the implementation of our growth strategy. It’s too early to speculate about specific steps. What is certain is that we share a common understanding of our business. SABIC is not a financial investor; it’s a strategic investor. If we were ever to consider divesting from individual parts of our business – such as our strategic currency Plastics & Coatings – we would only do so when we know exactly how to invest the returns. Hariolf Kottmann Absolutely. SABIC and Clariant follow much the same principles. SABIC is a successful, respected and very professionally managed company that places high demands on excellence and profitability. We have a professional and trusting relationship with our new strategic investor and we are confident that SABIC’s support will enable us to implement our strategy even faster. Our relationship and our discussions so far are very promising. Nothing changes in our general goals. We want to become even more profitable. We want to become even more innovative. And we want to grow even faster. 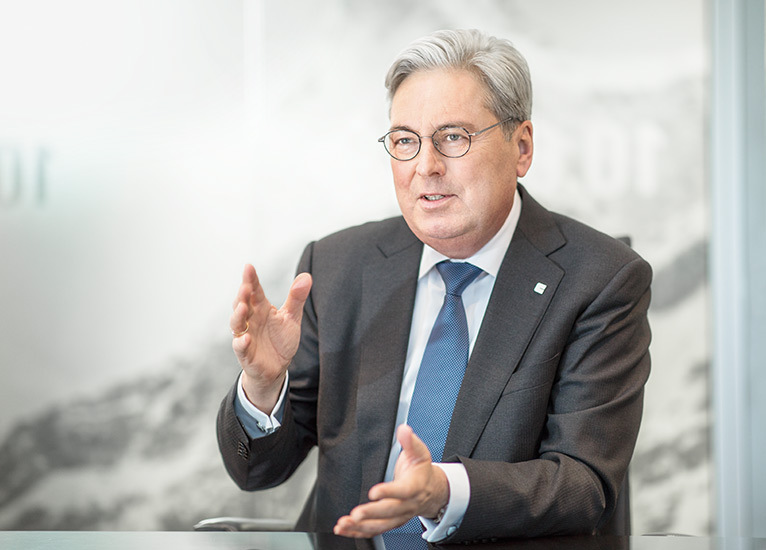 Clariant today is a strong, innovative and valuable company. That is the result of prudent strategy and hard work. And for that I want to expressively thank all our employees! We have great opportunities to independently and actively develop the company with SABIC and to create sustainable value for all our stakeholders. We want to continue on this path and shape the future of Clariant. The Board of Directors proposes a dividend of CHF 0.50 to the Annual General Meeting. That sounds like a long-term plan for value creation. What exactly does value creation mean for Clariant? Rudolf Wehrli Most importantly and as before, we want to create value for all our stakeholders – customers, employees, society and of course shareholders. We want to provide jobs for highly motivated and qualified people. We want to offer innovative and sustainable solutions for our customers that help them to master the most urgent challenges of modern society. And we want to help our shareholders increase their return on capital. Since 2011, Clariant has increased its dividend year by year. Once again this year, the Board of Directors will propose an increased dividend of CHF 0.50 to the Annual General Meeting, as the company’s performance has improved, despite the difficult economic environment. Hariolf Kottmann One example for value creation is our investment in biotechnology which has resulted in a first wave of commercial projects. We have signed a license agreement for sunliquid® and also announced the construction of a bio-ethanol plant in Romania. Another example is the fact that we increased our top-line growth through successful innovations in our various businesses. Just think about GlucoTain®, an innovative and sustainable range of sugar-based surfactants for the cosmetics industry. This performance has garnered recognition and praise from many of our customers and partners. Looking at the financial markets, Clariant was also included in the SPI™ Select Dividend 20 Index, in the MSCI Equity Switzerland Index, and again we achieved best-in-class rankings in the Dow Jones Sustainability Index. Speaking of Sustainability, why is there no longer a separate Sustainability Report? Does this mean that the topic is becoming less important to Clariant? Rudolf Wehrli No, quite the opposite. We have published our first Integrated Report for 2016. Last year, we further expanded integrated reporting in the company. We conducted an extensive review of our materiality matrix. Specifically, this means that we were asking a variety of internal and external stakeholders for their opinions on the topics that are critical to Clariant’s business success. The result of this analysis can be found in this report. Our long-term business strategy is also focused on these key topics, including innovation, growth, profitability, and sustainable chemistry. We also show how we manage these topics. If you take integrated reporting seriously, a separate sustainability report becomes obsolete. When a company adopts an integrated approach, sustainability is embedded. That’s when mutual impacts between finanical and non-financial indicators are considered and used to steer the business and review its performance. For their outstanding sustainability profiles, 169 products have been awarded EcoTain®. Hariolf Kottmann Sustainability is part of our corporate »DNA« and determines our actions on many levels. We have signed the UN Global Compact and the Responsible Care™ Charter – both are key initiatives in the field of sustainability. In doing so, we set the cornerstones for all our operations and committed ourselves to unconditional compliance with these principles. Additionally, we are steadily evaluating the impact and the contributions of our product portfolio in terms of society and the environment. This is possible due to a comprehensive sustainability screening under our Portfolio Value Program. Products with an outstanding sustainability profile that don’t compromise on product performance are labeled EcoTain®. As of now, 169 products have been awarded EcoTain®. They offer excellent value to customers. Given the clout of the EcoTain® brand, some companies use the label on their products to communicate their own sustainability efforts to their customers. Last year was characterized by a lot of change. Will this continue in 2018? Rudolf Wehrli A company like Clariant has to be in change constantly. This is necessary to anticipate, to adapt to and to actively shape a perpetually changing business environment. In other words, if we lacked the willingness to change we would cede control to others. Change is a good thing. It drives innovation and competitiveness. Hariolf Kottmann Our strategy addresses exactly that. The Clariant management will continue to steer the company with a steady hand to the top tier of the chemical industry. We will achieve this by leveraging our integrated approach to value creation into further increasing our profitability and delivering a return on invested capital well above the average in our peer group.